Here Are A Few Good Camp Stoves Under 50 Dollars To Ensure You Can Eat Well Outdoors Without Spending A Lot of Money. Cooking over a campfire is more fun than cooking over a portable camping stove, and there are some folks out there who are really good at camp fire cooking, and I like camping with folks like that, but sometimes a campfire cooking is not ideal. This is especially true in the great tinderbox of a state known as California which seems to explode in flames over the slightest provocation, and as a result campfires are not allowed in a lot of places. 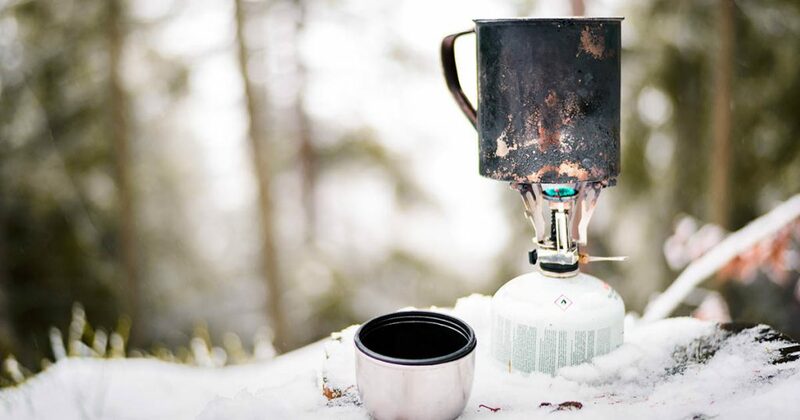 With that in mind we figured we should put together a list of our favorite camp stoves under $50, $40, $30 and $20. 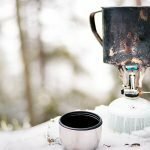 With all the new models of portable stoves being announced on an almost weekly basis it can be a bit overwhelming to try to find the best camp stove for your needs especially if you are trying to spend less than 50 bucks. 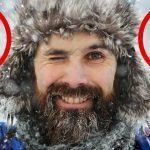 Hopefully this list will help you find the perfect stove with a bit less effort. 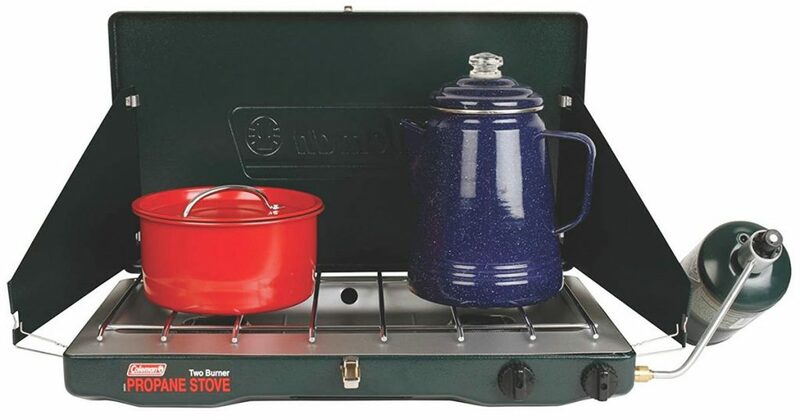 It is a classic propane stove made by a trusted name in making quality outdoor gear, Coleman. Cooking your favorite meals is made easy as you can cook from a 12-inch and a 10-inch pot at the same time while being heated from a burner with over 20,000 BTUs of power. 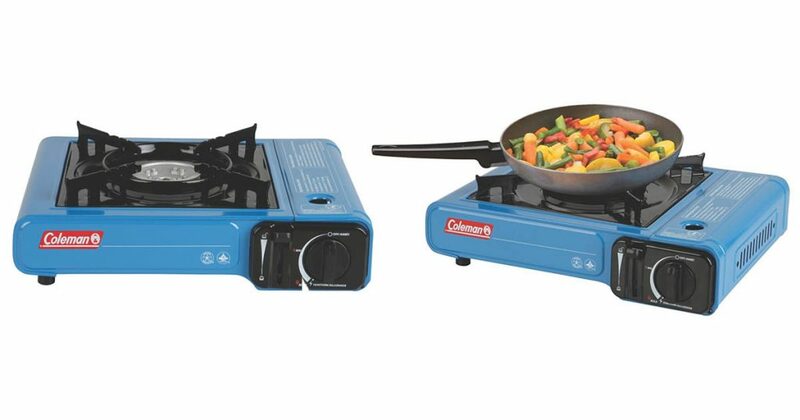 It features Coleman’s PerfectFlow pressure control for keeping a stable and even heat; WindBlock panels that shields the flame from the wind; and the PerfectHeat technology for an efficient cooking with less fuel. 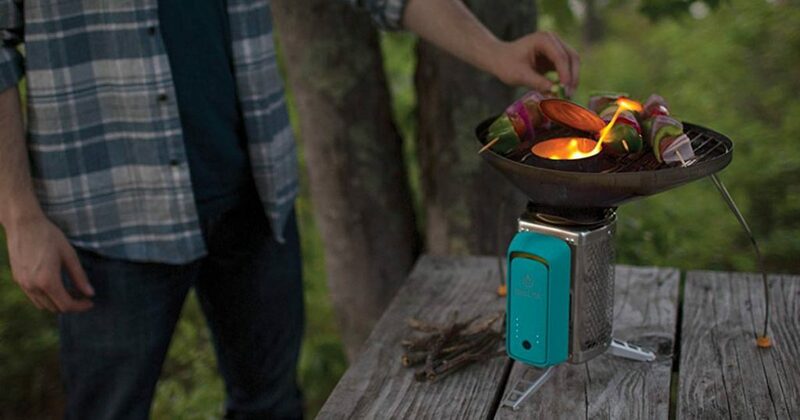 The CookStove from Biolite is a truly innovative product. It uses wood as a fuel source, but it has a battery powered fan speed tat controls flame size. The fan is powered by an external USB battery pack that provides 30 hours of use from one charge, so it will last for a multi day camping or backpacking trip easily. If the battery does eventually die than the stove just works like a regular wood burning camp stove without the ability to adjust flame size. 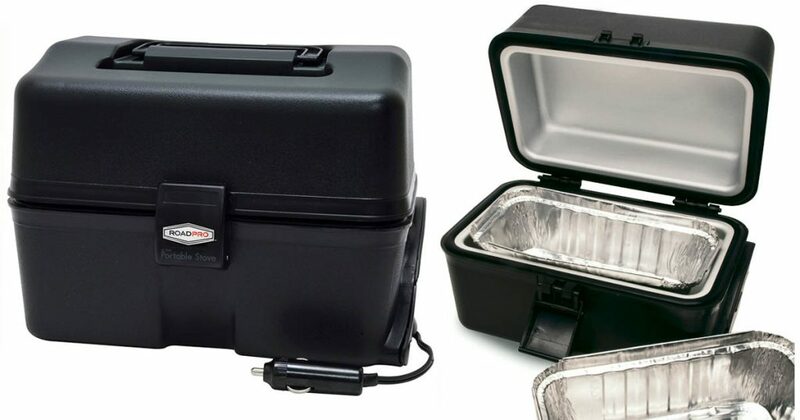 This portable stove kit requires 12-Volt power port, which can be used when you have a vehicle with you or if you’re going to a campsite with power outlets. It provides up to 300 degrees of heat for food warming or cooking up stews, beans, or rice. 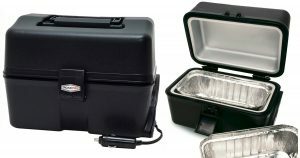 It is made to use 8”x3.75”x2.5” disposable aluminum pans for convenience and easy clean up. The Coleman single burner butane stove has not reached the classic status of the Coleman Double Burner Propane Stove mentioned above, but it is easy to use and compact for those times wear space is an issue. 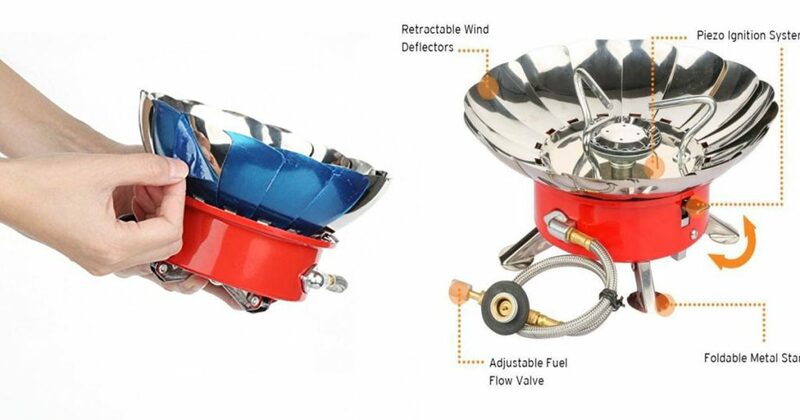 The Instastart automatic ignition is really dependable, so you don’t have to worry about bringing matches or a lighter and the wind baffles are a big help if you are camping in a windy area. The Pelada stove may be relatively small, but it is tough. It can hold up to 66lbs, so if you ever need to boil large quantities of water this is the stove for you. The fact that it is wood burning means that you do not need to worry about bringing along fuel. Like the BioLote CookStove mentioned above the Pelada uses a battery powered fan to get oxygen to the flames when you really need to crank up the heat. 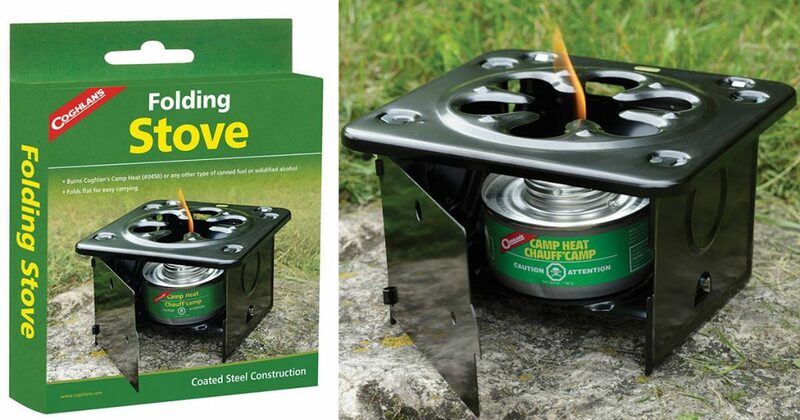 Its the Amazon’s Choice for a portable stove camping. 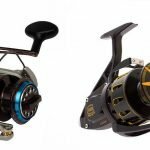 It is also bears approval from the US and Canadian Standards Association. 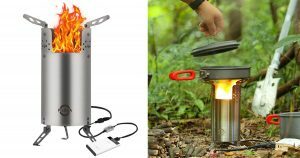 It’s heat resistant knob and the built-in Piezo ignition with safety shut off system makes it a convenient choice for most campers. Not to mention that matches or lighters are no longer needed.It boasts its high BTU of up to 9000 for extreme heat output. 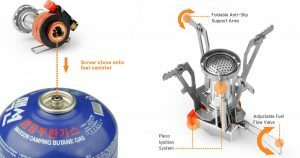 Fuel Type: Butane or butane/propane combo. The E-gear from Etekcity is a very versatile stove, because it is compatible with both thread and lock type connectors, and it works well with straight butane fuel canisters or butane/propane mix canisters. 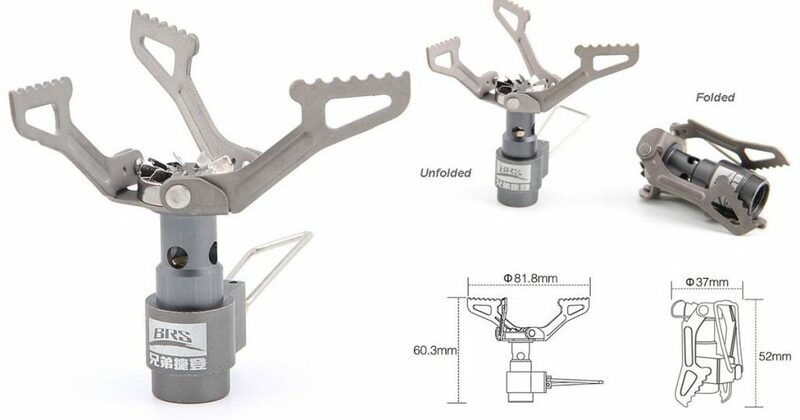 The E-gear stove is not as compact as some smaller backpacking stoves, but stabilization legs are worth the extra weight, because they make it so much easier to keep the stove stable on windy days or on uneven surfaces. 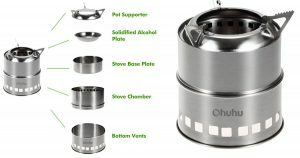 There’s no need to use any petrol fuel or alcohol in using the Ohuhu 174 Backpacking Stove as it allows you to make use of nature’s dried twigs, leaves, pine cones, and wood. It features its 3-armed support system for a more stable cooking platform even on uneven surfaces. It is fold-able and comes with a carrying case. It is made from light and durable materials such as stainless steel and aluminum alloy to suite the portability needs of a backpacker. 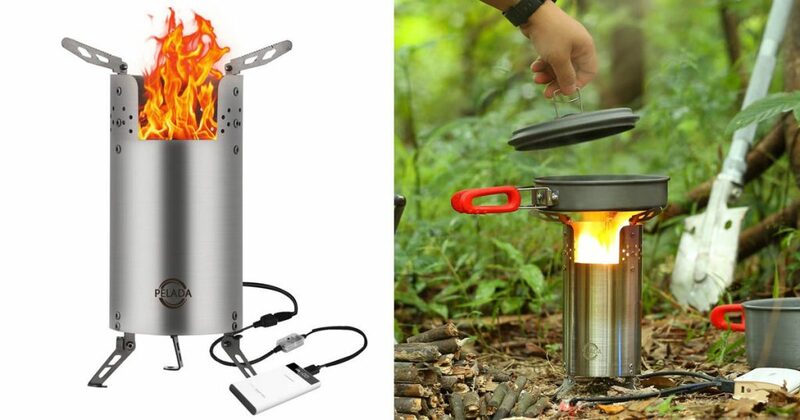 It features the Piezo Ignition System, a built-in electric spark system, that promises to provide quick ignition and a consistent, strong flames on both high and low settings. You can cook from your 18cm diameter pot with the Etekcity Ultralight camping stove without leaving debris or soot behind. The Coghlan’s stove comes in two types: the folding and the emergency stove. They are both made with durable steel that can hold a heavy pot steadily. 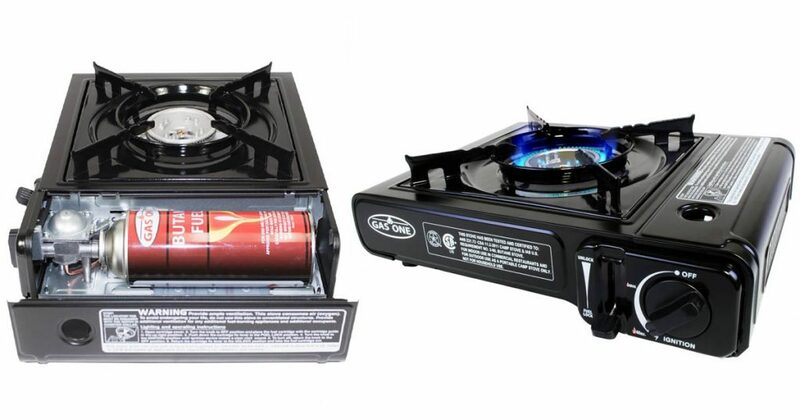 They both require Coghlan’s Camp heat or any canned fuel or solidified alcohol to provide heat. It is designed with a front door and sides to protect flame from the wind. The titanium alloy BRS Only is an extremely lightweight and compact stove that is perfect for backpacking, because it takes up almost no room. In spite of it’s light weight and small size it is surprisingly durable and should provide years of use.